Helping smart career changers & entrepreneurs design amazing businesses & careers, so they can make an intelligent transition faster! I work with entrepreneurs in transition and career changers from all over the world via Skype or via online training courses. I draw on extensive experience of providing transition, career change and entrepreneurship advice to over 600+ clients, 10 years+ of owning an international transition consultancy AND a background in HR for Morgan Stanley, Shell and Citigroup. As a result, I can offer you the practical know-how, frank advice and strategies you need to actually make your business or career transition happen, whether you are a career changer looking to start your first business, an existing entrepreneur wondering if you need a change or needing help deciding which of your many options to pursue next. Nobody should have to put up with a soul- sucking job or business when there has never been a better time to design, create or track down a career on YOUR terms! You didn’t come here to just collect a paycheck, put up with toxic company cultures, office politics or live for your weekends/holidays. You came here to build a career and business around what’s truly unique about you and what you love spending your time doing, thinking and talking about. AND make money doing that! The world desperately needs more exciting role models. Men and women who create careers and businesses that never existed before OR who make you go “that’s just SO you!” when you discover what they do for a living. My mission is to help YOU become one of them. The fastest way to change the world is to do what you love – You’ll be able to encourage others do the same and have more energy to do what really matters. This is your window of opportunity – Don’t wait any longer! You don’t have to go it alone – I CAN HELP. Employee wanting to join the entrepreneurial ranks? New entrepreneur who already made the jump, but didn’t get it right? Need focus and a game plan? Wondering if you are in the right business? Or ready for your next move? Highly driven, but overwhelmed or overthinking? 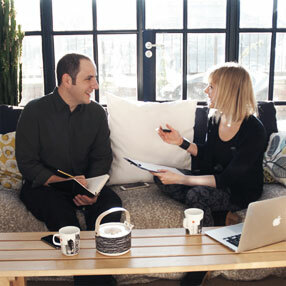 Work 1:1 with Rikke to nail down your next/revamped business! GET THE ONLINE PROGRAMME - YOUR CAREER CHANGE MAP! Ready to go from fed up employee to fired up entrepreneur? Tired of figuring it all out by yourself and want strategies that are realistic and proven to work? Email Rikke@rikke.me for more info. Get the step-by-step online Course AND live access to Rikke via Group Q&A calls! I’m a passionate foodie, cook, red wine, green tea and juice enthusiast. Several months every year I work from new and beloved places around the world where I also immerse myself in the local food, craft, culture, yoga, wellness and entrepreneurial cultures – I have a feeling YOU might be part of (at least) one of those tribes as well! I was born in the Danish countryside (hence my name “Rikke” – just call me “Ricki”) and grew up surrounded by open fields and the sea. In 1993 I moved to Paris for 3 years (was supposed to be a 1 week holiday…) and have been calling London home since 1996. I spent my twenties working in Human Resources climbing the corporate ladder at Morgan Stanley, Citigroup and Shell. Whilst I did enjoy the people side to my career there, the long hours were exhausting and unpredictable, the culture became increasingly toxic and I was tired of being told when/where/how to work and let’s not even talk about office politics… However, I always knew that I wanted to “do my own thing”, so in 2005 that’s exactly what I did and my transition consultancy was born! There is nothing I’m more passionate about than helping my clients nail down what they really want to do (and how to translate that into a business they love running) and I continue to lead, attend and participate in advanced training, conferences and masterminds all over the world within my field of expertise. As a result, you will have access to the most cutting-edge information, strategies and resources available in the entrepreneurial world! ARE YOU READY TO GET THE CLARITY, CONFIDENCE AND FRANK ADVICE YOU NEED TO MOVE ON? To finally just be yourself and create a business that truly makes you happy? Then I think we will get on like a house on fire! Career Changer / New Entrepreneur - Click HERE! Entrepreneur in Transition - Click HERE!